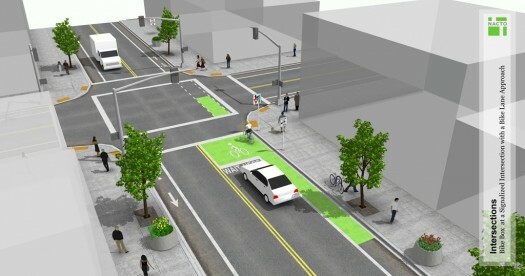 Image of a bike box from the NACTO Urban Street Design Guide. Today and tomorrow, Oakland will host the National Association of City Transportation Officials (NACTO) Cities for Cycling Road Show, which brings experts on NACTO‘s Urban Street Design Guide to Oakland to meet with city planners, engineers, and elected officials. The event is an opportunity for Oakland city staff and decision-makers to gather together to discuss the challenges and solutions in completing creating a network of safer streets for biking. They’ll receive guidance from representatives of New York City, Chicago, and Boston, all cities that have extensive experience using the NACTO guide and putting its bike infrastructure designs on the ground. 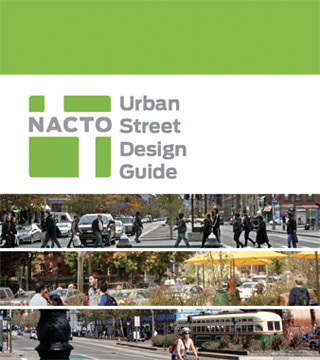 The NACTO Urban Street Design Guide is being adopted by more California cities, though Caltrans hasn’t endorsed it yet. The Urban Street Design Guide shows how streets can be redesigned to be safe for all users — bicyclists, pedestrians, transit riders, and drivers. Oakland is one of 28 cities and three state departments of transportation that have endorsed the guide as a resource for designing its streets. San Diego, Davis, and San Francisco are the only other California cities that have endorsed the guide. Caltrans was also urged to endorse the NACTO guide in the recent report calling on Caltrans to reform its car-centric culture, conducted by the State Smart Transportation Initiative. Since 2009, NACTO Cities for Cycling Road Shows have taken place in eight NACTO cities. Road Shows take on the specific issues and projects of their host cities. For example, in Atlanta NACTO provided comprehensive training on protected bikeway design, and in Boston the focus was on how to build out the city’s bike network over time. In Oakland the focus will be on two projects: Telegraph Avenue and 14th Street. The city is currently working on the Telegraph Avenue Complete Streets Project, developing alternative designs for bicycle facilities along the popular biking street. Bike East Bay has pushed for protected bikeways like the ones featured in the NACTO guide. The Road Show offers an opportunity for a broad discussion among city staff and NACTO planners about the design concepts, which will be presented for public feedback in a series of open houses on April 24, 26, and May 1. Fourteenth Street has been identified as an important east-west bicycle connection through downtown Oakland, but its design has not yet begun, so the Road Show will offer a chance to discuss ideas at a very early stage. Day one of the Road Show will be focused on technical training for bikeway designs. It’s designed mostly for Oakland city staff, but reps from other local agencies including BART and AC Transit will also be there. The second day will focus on policy, with a forum on how bike infrastructure aligns with the city’s economic development and other goals, as well as presentations from other cities that have successfully accelerated their own bike lane programs. “The goal of the Road Shows is to focus on individual communities and get people in the same room talking about these issues,” said Parks. The Road Show isn’t open to the public, since it is designed to provide a chance for staff and elected officials to grapple with design and policy issues together. However, Bike East Bay and Walk Oakland Bike Oakland are hosting a reception with the NACTO speakers, advocates, and city officials tonight. Awesome. Major kudos to Bike East Bay for pushing for a real solution for biking on Telegraph, and not just some half-hearted bike lanes. A protected route there would be transformative for cycling in that part of the East Bay. And another good nudge for making Telegraph and end to end business district from DTO to Campus. Lots of good momentum in improving the 20s, and there is good potential in the 30s, 50s and 60s. And the zone between Ashby and Parker-ish. Hey what about the 40s?! They’re building that block-long TOD at MacArthur Bart which is as good an opportunity as any to spruce up the street. Unfortunately local merchants like Beauty’s Bagels have made statements against bike improvements and in favor of parking.